Over the past few years, I have had the opportunity to visit with a few hundred general managers (GMs) at mostly large insurance enterprises. While all were polite and patient, many expressed reservations when I tried to persuade them to make new, or deeper, investments in data sciences. For the most part, I found the GMs to be logical, objective and direct when laying out their frameworks for investment decisions — whether to meet internal demands for platforms and talent; or to meet demands for hiring external vendors or consultants such as my organization. I now have a special appreciation for the finely-honed intuition GMs have developed to be skeptical about data sciences investments when they don’t make sense. Based on inputs from GMs, who approached our discussions from a multitude of perspectives, I’ve tried to synthesize their collective wisdom into a practical rubric for envisioning the impact of any proposed investments in data sciences. Today, I continuously rely on this simple rubric as I work with our teams to explain and deliver value for clients. The focus of the rubric is not on curiosities or insights; but rather on elements and outcomes to create significant business impact in the clients’ eyes. It stands to reason that both GM and data scientist perspectives are critical for the benefits and value of data sciences to be successfully applied to the most vexing challenges in insurance. In practical terms, data sciences efforts will need to align as closely as possible with the aspirations of GMs relating to growth, profit and experience (for their clients, partners and employees). 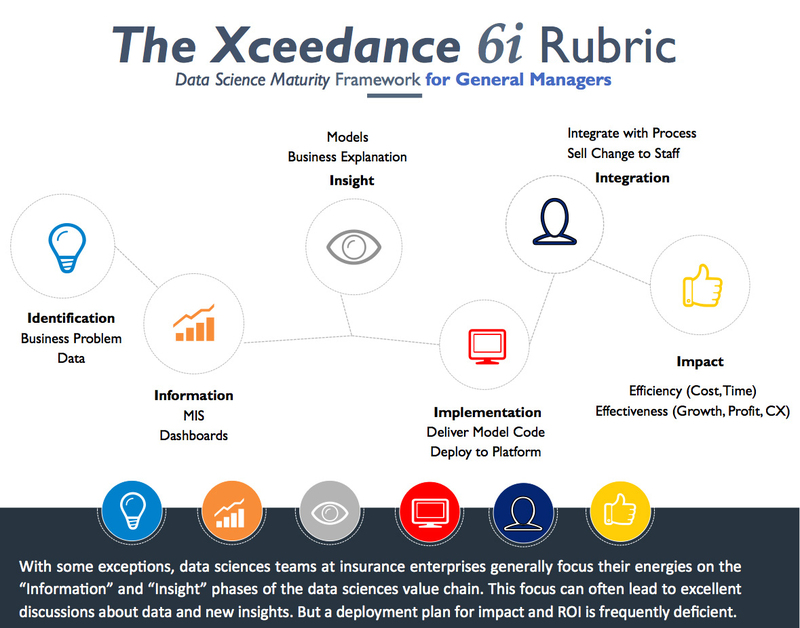 At Xceedance, we feel that it is helpful to assess maturity of enterprise data sciences capabilities in the context of six critical, execution-related dimensions as shown in the illustration below. Those dimensions also have to be orchestrated well — to drive the anticipated business impact from the work executed by data sciences teams. To be more specific, we actually mean that the data sciences team itself must be capable of performing well in all six dimensions. Note: In the illustration above, under the “Impact” category, the cost aspect of the efficiency element refers to savings made possible from the process of optimizing company operations. Whereas the profit aspect of the effectiveness element is much broader and includes margin contributions due to, for example, better risk selection. For most teams, including ours at Xceedance, maximum focus is required on describing a comprehensive end-to-end solution architecture. Just as crucial is getting full buy-in from stakeholders and establishing the accountably for execution — all the way from a tightly structured problem statement, to a solution that will integrate well with the platforms, people and processes in the “to be” state. Of course, in addition, we’ll need to create and agree on metrics or KPIs, and systematically measure the impact from the efforts of the data sciences teams. Coming soon: Commentary about a parallel rubric for data sciences teams. The companion post can help teams think about strategy, structure and coordination to drive meaningful business impacts for their own organizations. Rajesh Iyer is head of data sciences at Xceedance. Learn more about Xceedance data sciences here.